March 2012 – Contemporary Controls is looking forward to a busy April with two shows two weeks apart. We'll be showcasing new products at Light+building April 15 - 20 in Frankfurt, Germany. The show remains one of the largest in Europe for the building-services industry, with more than 183,000 visitors expected and more than 2,100 exhibitors. This year's Light+building theme will be energy efficiency. The show provides us with an opportunity to meet our European customers and present our latest innovations in building automation. Stop by Hall 9.0, Stand B21 and say hello if you are attending Light+building. On the other side of the world, we'll be attending the Niagara Summit April 29 - May 1 in Las Vegas, Nevada. The summit provides an opportunity for us to meet and exchange ideas with other Niagara and Sedona users and developers. 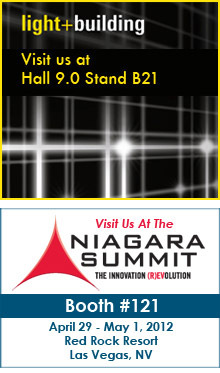 Niagara Summit brings together system integrators, manufacturers and users of the Niagara and Sedona Frameworks. Contemporary Controls will be giving two presentations at the Summit. More details about the seminars and the products we will showcasing will be available in our April newsletter. If you are attending the event, please stop by. And if you're considering attending, we strongly encourage you to do so. The Niagara Summit is an open forum that presents a host of educational opportunities.